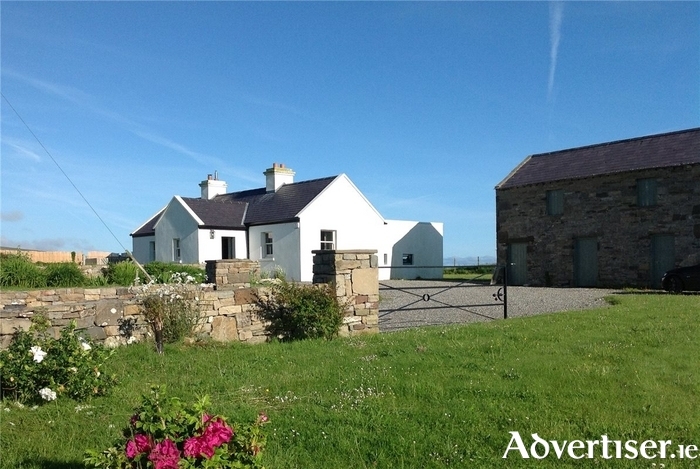 Sherry FitzGerald Feeney West introduces this stunning property located in Lisbrin, Ballycastle, in north Mayo, with breath-taking coastal views. The property has been meticulously upgraded and extended to combine traditional features with modern amenities and views. It is presented in immaculate decorative condition with interiors offering incredible taste and style with the attention to detail and high-quality workmanship evident throughout. The property offers the discerning purchaser spacious, open plan, living accommodation, with sea views and a great location on the Wild Atlantic Way. The property is set on a mature site of approximately 0.79 of an acre, a two-minute walk to the sandy beach. This property would be an excellent opportunity for owner occupiers who desire an easy to maintain family home in a beautiful countryside setting or as a holiday home in north Mayo. A truly superb home in exceptional condition in a very peaceful and serene location. Accommodation boasts a spacious and bright open plan kitchen/dining/living room which was extended to the existing property in 2009, with fully fitted bespoke kitchen units, electric oven and hob, Belfast sink, and solid fuel stove. The large architect designed living space has floor to ceiling glass walls. There are three double bedrooms, two of which have fitted wardrobes with master en-suite. The luxurious bathroom and wc have a natural stone feature walls with tiled flooring. There is underfloor heating throughout. An added advantage is the two storey natural stone granary that could be converted for a number of uses subject to planning permission (if required ). Ballycastle is the nearest village to this property, approximately 2.3km via the R314 which provides amenities such as shops, pubs, church and schools. Ballina is 29.7km via the R314 and Castlebar is 67.1km via the N26. From Ballycastle going towards Belderrig on the R314 turn right onto Sea Road at the end of the village, travel down this road and keep right at the beach and it is the second property on the left.